Maybe you are thinking about replacing your roof or maybe you want to change the appearance of it, or perhaps it’s time to do a serious upgrade because your roof looks old and damaged. If you are here, that means you are researching and looking information about roofs, shingles, flashings, membranes, and other parts of a roof. There are a lot of roofing materials available, like concrete, ceramic, fabric, polyester, asphalt, even wood in some cases. Another question so many people ask is which material will have the longest lifespan, that looks better than the rest. Some of these also can increase the value of your home, but in this article, 1st Class foam Roofing and Coating, a foam roofing contractor located in Arizona, will explain to you why foam is one, if not the best, material of choice for your roof. You don’t need experience in roofing to know that dealing with roof repairs is serious business. This means that roofing is tough to deal with and it can be a bit expensive and difficult to do. However, if you chose foam roofing in Glendale, it’s the easiest material to repair in a quick and easy way! You just have to add more foam in the right places and that is it! Foam roof repair in Glendale has never been easier. You can contact us at any time as soon as you want your roof replaced with this awesome material. We will make it look better than ever! Guaranteed! This statement is true! Our foam roofing is really durable, and since it is really flexible, if your house naturally changes its form overtime, your roof will accommodate to the same form. This is one of the main reasons why people will upgrade their roof to this material; it helps our customers prevent serious damage, cracks, and other issues with their roof, making them save money on repairs and maintenance. If you ever have any question about our roofing, don’t hesitate to reach us! If you live in a zone with a lot of humidity in the air, your roof will be affected with moisture, damaging it and leading to possible leaks that will go through it and flood your home. We don’t want you to be in this circumstance; call a foam roofing contractor as soon as you can, like us, for more information. Foam is capable of helping your roof by preventing moisture from the air getting inside your shingles and other roofing materials since it is airtight. Also, it will help you prevent other issues like mold, mildew (a form of fungus) and others. 4. 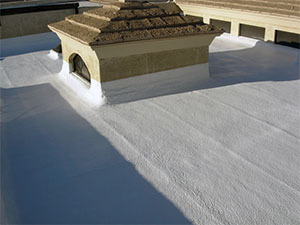 Foam roofing is the one that will prevent roof leaks. You know those bad leaks that will start to grow bigger and then make your house fill with water, damaging all your furniture and your home’s structure? You can start saying goodbye to that. Most of leaks happen just at the seams, where normal roofs are installed. The good news is that our foam roofing has no seams, and that will decrease exponentially the chance of a leak to happen by this reason. 1st Class foam Roofing and Coating can assure you that this will make you save money and your roof will last a lot of years longer! Contact us and let us show you that we have the most affordable prices on the market. 5. Don’t want to change roofs? Leave yours in the same place! This doesn’t really apply if you are installing a brand new roof on a new home, but… Do you know that you don’t have to modify your actual roof in order to have a new foam roof? No, we are not lying. A spray foam roofing company is able to do something like this, because foam roofing is so light, it can be installed over your already existing roof; it’s like that movie of a dream inside a dream, only much simpler. 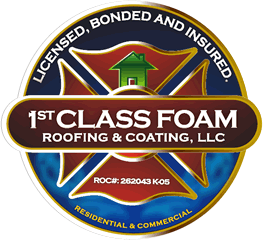 Our company, 1st Class foam Roofing and Coating, have a great amount of experience in this line of work guaranteeing that our spray foam roofing will help you save money. Give us a call at any time!